Blind dates aren't just for strangers, but when it comes to dating your best friend how can the friendship survive? 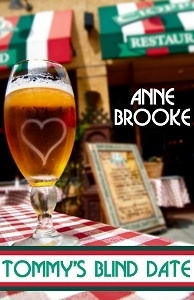 GLBT short story, "Tommy's Blind Date", is published by Amber Allure Press. Thirty-two year old Tommy Godolphin has been on a series of blind dates, as he doesn’t want to be single any more. However, none of them really hits the spot and the latest one has proved a complete, if amusing, disaster. When he recounts what happened to his best friend, Jacob, he expects Jacob to laugh with him as usual, but this time he doesn’t. Instead, Jacob challenges Tommy to go out on a blind date with him, to see what, if anything, he might be doing wrong. If Tommy accepts, how will their friendship survive? Please note this story contains adult content.